Listening folklore, especially in Sub Leuwidamar Lebak Banten generally come from the tribe Baduy 3rd place, so both of how to dress, appearance and very different spesipications. It is said that at about XI and XII century Pajajaran Kingdom controlled all the land Pasundan ie from Banten, Bogor, Cirebon Priangan down to the area, at that time that the king is the king with the title of King BRAMAIYA MAISATANDRAMAN SILIWANGI. Then on to the XV century with the introduction of Islamic doctrine developed by the Gujarati merchants from Saudi Arabia and the Wali Songo in this case is from Cirebon, Sunan Gunung Jati, from North Beach to the southern area of Banten, so the reign of King getting caught and fragile due to the many people entering the religion of Islam. Finally the king and the Senopati soldier and still faithful to leave kingdom into the jungle toward the south and follow the river upstream, they left their places of origin with such determination that is spoken in rhyme Tribe ceremony Baduy "Far dijugjug nu teu Ramlee, leumpang teu puguhnu diteang, malipir dina gawir, nyalindung dina mountains, mending keneh lara jeung wiring tibatan ngayonan kudu nu saturunan paduduluran jeung war, neither the jeung Baraya sa nu still keneh wangatua "
That means: much is uncertain that go (Jugjug), walking with no destination, walking by the cliffs, sheltered behind a mountain, it's better than shame and humiliation at having to fight with their relatives or family who is still a derivative "
With the characteristics: white-clad results of the hand (clothing sangsang), white headband, wearing a dark blue sheath (homespun) up above the knee, and carpenter's rare appearance to talk (if necessary) tapir maid, strong on customary law, is not easy affected, strongly opinionated but thoughtful. According to the story, that became Senopati in Bantam at the time was the son of Siliwangi King named Seda King with the title Prabu Pucuk Umum after Cirebon and surrounding areas controlled by Sunan Gunung Jati, so he sent his son, named Sultan Hasanuddin with his soldiers to develop the Islamic religion in Bantam and surrounding areas. So that the situation in Banten with the Prabu Pucuk Umum’s soldier leave the throne in Banten into the jungle and go along the river to the Upper Ciujung river, then this place they call Overtime Singkur Mandala Singkah which meant a quiet place to leave the war and eventually this place called Goa / Panembahan Arca Domas highly in culture. This descent who later settled in the village Cikeusik (Baduy Dalam) with the equivalent of the village Typical Cikeusik namely: his character hard, indifferent, it's hard to talk to (only if necessary), strong against Customary law, not easy to accept help from others who are giving, wearing a white shirt (Grey) or from leaf fibers woven Pelah, white head band wear sarongs woven dark blue (above knee). The definition is from the mixing of tribal Pengawinan tribes who at that time there was coming from Sumedang, Priangan, Bogor, Cirebon, also from Banten. So most of them consist of people who are illegitimate is coused of Prabu Prabu Siliwangi and Prabu Pucuk Umum thrown into a certain area. Even this type is driven by developments follow the religion of Islam spread to many regions so blurred the township but there was also a vague wilderness jungle, so there are some who live in the district Guradog Maja, there continue to settle in the village Cisungsang Bayah district, and there are settled in villages and village Sobang Citujah Muncang district, then the places mentioned above there are similarities characteristic own. As for the rest of their partly dispersed follow / Ciberang down the river, and river Cisimeut Ciujung each headed up the river, and this group eventually settled in 27 settlements in Baduy Panamping (Outer Badui) Baduy village Leuwidamar sub-district of Lebak with cirri characteristics; dressed all in black, dark blue batik headband, the vehicle may be traveling with rose, sedentary farming, a farm worker, easy to talk but still affected the existence of customary law because they still be obedient and faithful to the customary law. From tribal Baduy panamping in 1978 by the government held PKMT projects (community resettlement estranged), which are located in villages and Cipangembar Margaluyu Leuwidamar village and subdistrict Leuwidamar government continue to be developed by this project in the first and second Kopo village, ward and village Sukamulya village Sukatani Jalupangmulya Leuwidamar district. 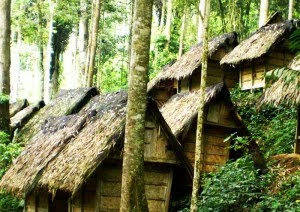 Panamping Baduy tribe that has take place in outside of Baduy Dalam is called a Muslim, because this group has embraced Islam, and even some that have been conducted into the 5 pillars of Islam which is Hajj. The mean of Baduy Dalam is Baduy tribe that resides in the Three Tangtu (Kepuunan) Cibeo ie, Cikeusik and Cikertawana. Panamping Baduy tribe means a tribe Baduy bedomisili outside Tangtu that occupy the 27 villages in the village that still terikatoleh Baduy led Puuun customary law (adat chief). 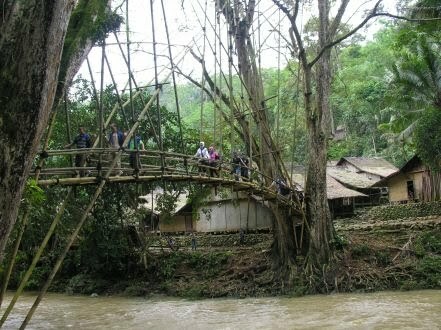 Baduy Muslim tribes that have tribal Baduy that take place and have followed the religious teachings of Islam and behaviors have begun to follow the outdoor community and had not followed the customary law. The title story is the elbow Baduy by Bedouin origin of the word, ie the title of the class / of Islam that meant because the tribe did not want to follow and obey the teachings of Islam, while the Arabian group called the Bedouins that such a rebel faction that is not insubordination and difficult to be set so that the designation is a designation Bedouin Tribe Baduy.